Powers/Abilities: He could alter his density and teleport himself and others through the shadow world known to him as Zeitgeist for several miles. The teleportation was stressful for a normal human and could cause nausea. It was somehow supported by the spirits he was also able to release to pass judgment on others. If these spirits found somebody guilty his/her heart just stopped. Each night he was summoned to Gramercy Park by spirits' voices and then a carriage came and brought him to the Zeitgeist. In this realm he was only an observer who couldn't end the victims' pain of the murders he was brought to by the carriage. History: (Deadline#1 (fb), Deadline#4 (fb) - BTS ) - Years ago Michael Hart started out as a defense attorney specializing in super-powered criminals. He was known for his good looks and his slick victories. He made dirty deals on a daily basis at this point of his life. 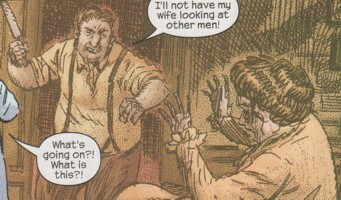 Among his clients his many clients were villains like MODOK and the still undefined murderer of the Agent (Rick Mason). With the money he made he became the owner of his own apartment building. (Deadline#3 (fb) - BTS) - Michael defended the Black Cat in a case of theft. His future wife Alice testified that that the Black Cat was possessed by the Cor Vacuus she had stolen and Michael won the case. Alice and Michael became a couple and he tried to change his life for her. (Deadline#1 (fb) - BTS) - When the governor created a special arm of the Circuit Court for superhuman crimes Michael Hart became judge. In his new job he suddenly started to lock away all the super-powered criminals he got off when he was a lawyer. Among the convicts were villains like Bullseye, the Tinkerer and many others. The press loved it and dubbed him Judge "No" Hart. (Deadline#2 (fb) - BTS) - His change of conscious made him extremely unpopular among criminals and many former allies became his enemies. (Deadline#4 (fb) - BTS) - One day the Tinkerer decided to ruin Michael Hart's career because he blamed him for his son's death. He walked into Hart's apartment building wearing one of his hologram gadgets and went up to Hart's apartment. There he searched for incriminating documents he could give to newspapers. (Deadline#2-3 (fb), Deadline#4 (fb) - BTS) - Michael and his newlywed wife Alice came home to their apartment building, but Michael left again to get some milk for breakfast while Alice went up to their apartment where she surprised the Tinkerer, who accidentally killed her while they struggled. When Michael returned the door to his apartment was open and inside he found his dead wife and her murderer, the Tinkerer, who panicked and shot Michael. (Deadline#4 (fb) - BTS) - The Tinkerer carried Michael Hart with the help of the buildings' doorman to a taxi. Tinkerer told the doorman that Michael had too much to drink and got into a shouting with his wife and now he wanted to take Michael to his place to sleep it off. The doorman believed him and the Tinkerer gave him a Rolex for his help. (Deadline#1 (fb) ) - The police were called to Michael's apartment on a domestic disturbance. There his wife was found dead and Michael Hart was missing. (Deadline#2-3 (fb) - BTS) - At Tinkerer's place Michael Hart's heart stopped for a moment, but the Tinkerer brought him back with his machines. 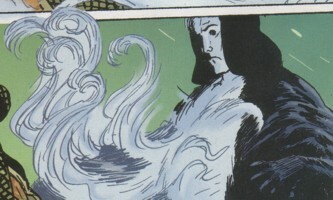 While Michael was dead his skin turned white and he became connected to the spirits from the Zeitgeist realm. After Michael's resurrection the Tinkerer nursed him back to health. (Deadline#4 (fb) - BTS) - Michael became the vigilante Judge, and the Tinkerer helped him with information to find the super-powered criminals. (Deadline#1 (fb) - BTS) - Within three (originally six in Deadline#1; see comments) months Judge killed six super-powered criminals. Carjack became his seventh victim. (Deadline#1) - Judge saved journalist Kat Farrell (who was working on the Michael Hart story although it was Paul Swanson's story) from the criminal Third Rail who became his eighth victim when the spirits within Judge found him guilty and killed him. Kat wanted to talk to the Judge, but he just disappeared in the shadows. (Deadline#2) - The Judge asked Kat Farrell in her dreams to come with him because he needed her. After a day of hard work Kat Farrell watched a fight between Spider-Man and Dr. Octopus and the Judge saved her from falling rubble by teleporting her across town to Gramercy Park. He told her that he wasn't Michael Hart anymore and showed her a bench he sponsored in his wife's name to her 30th birthday. He couldn't remember who killed his wife, but the person who did, shot Michael as well. After telling her this, the Judge teleported Kat back to her Vespa Scooter. He sent her to the Tinkerer, who was helping the Judge, and once again disappeared in the shadows. The next evening the Judge found Kat Farrell in a church and asked her to come with him. (Deadline#3) - The Judge teleported Kat again to Gramercy Park and told her that the spirits wanted to see her too. He took her in a ghost carriage to a place Michael's wife once called the Zeitgeist, which Judge described as a place for those not ready to pass on. On their way they talked about Michael's wife Alice and Judge's supernatural powers. When they arrived the Judge told Kat to lower her voice because Zeitgeist was a dangerous place he had only begun to understand. Judge went with Kat into a house to witness the murder of a woman by her husband Andrew. Judge stopped Kat from interfering and carried her back to their carriage where he further explained to her that the people in the Zeitgeist were all suddenly taken out of their life and didn't even realize they were dead. For unknown reasons they were calling to the Judge who had to watch them die night after night and he couldn't do anything about it. This made the Judge so angry that he acted out in the real world and Kat suspected that this could be the reason why the spirits brought him back to the Zeitgeist each night, because they couldn't get their revenge so they wanted it now for somebody else and Michael was their tool in the real world to do it. They returned to the ghostly streets and the Judge showed Kat the murder of detective Patrick Callaghan's wife, Jodi. Her murderers returned, but the Judge stopped the evil ghosts by absorbing them and their car. More mobsters came, and Kat had to pull the weakened Judge from the street to save him. Back in the carriage Judge told her that he just couldn't resist avenging the woman and that it was sometimes a problem for him not to interfere. The carriage then brought them to Alice's murder three months ago. Judge and Kat went up to his former apartment where they found Alice and her shadowy murderer. Alice's ghost told them that her murderer was already there when she entered the apartment. Kat tried to stop the murder and forgot about Judge's warning not to interfere. The murderer turned his attention to Kat who attacked him with a candle holder followed by a charging Judge. All three went through the wall and Kat would've fallen to her death if the Judge hadn't teleported her back to Gramercy Park in the real world where she still held the candle holder from Michael's ghost apartment in her hands. (Deadline#4) - The Judge appeared when the Tinkerer threatened Kat Farrell after she had found out that he was the murderer of Alice and Michael Hart. After learning what Kat already knew the Judge attacked the Tinkerer. He tossed him through his greenhouse's door and followed him to tip of the building's roof. He let his spirits loose, but the spirits didn't kill the Tinkerer. Although the Judge was surprised by this, he accepted the spirits' judgment because he saw that the Tinkerer still had to serve a purpose. Kat was sorry that she ruined the relationship between the Judge and Tinkerer, but for the Judge it wasn't over yet. He wanted to continue his work with the Tinkerer because he finally realized that he probably wasn't still on Earth for revenge, but to redeem himself. Kat didn't publish the story about the Judge formerly known as Michael Hart, and Ben Urich was proud of her because he did the same for Daredevil. (Civil War: Battle Damage Report) - Tony Stark listed Judge's status as undetermined. There was a small continuity error within Judge's history. In Deadline#1 Jimmy Woo tells Farrell that the killings began six months ago, but the Tinkerer told Kat that he found Michael Hart's body three months ago (Deadline#2) and later in the Zeitgeist Alice's murder was also three months ago (Deadline#3). At first I thought that it was an intentional mistake by Rosenmann to show what a liar the Tinkerer was, but when the time span returned I wasn't so sure anymore. Perhaps Michael Hart couldn't remember and just believed Tinkerer's lies as well or it was a mistake. Zeitgeist has no real translation (Spirit of the Time seems like a nice attempt, but I don't know if it should even be translated) and is the definition for a concept by German philosopher Johann Gottfried Herder. It should mirror the intellectual and cultural climate of a time or epoch. The word itself was created by the German philosopher Christian Adolph Klotz. The Zeitgeist in Deadline is a realm of ghosts. Judge gave a nice explanation for this in Deadline#3 (see above). It won't be included as a sub-profile as it definitely appeared in many other comics although it was never called Zeitgeist before. You will definitely find it connected or at least BTS in stories with ghosts. I was pretty sure that I had seen Judge's necklace before in Amazing Spider-Man I#204-205, but when I looked into Felicia's love item related thefts in this storyline it wasn't there. Maybe I was wrong and it didn't appear before or it was another story. Its name was revealed in Judge's profile in OHOTMU A-Z Hardcover#6. 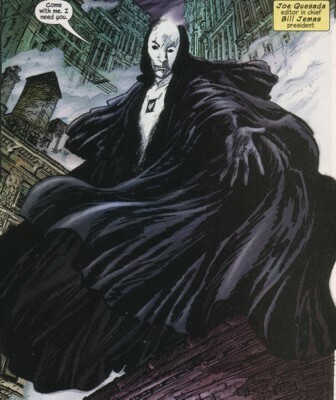 Judge appearing in Underworld gave me a big headeache. He was a good-hearted vigilante and suddenly he turns up as the lackey of a mobster, but Ronald Byrd talked to Rosemann, who told him that it was a Scrier and not Judge appearing in Underworld. It is hard to tell Judge apart from a Scrier, so this works fine by me. (Deadline#3 (fb) - BTS) - A long time ago Andrew and his wife lived in a house in New York. Andrew was a jealous man and one day he cut out his wife's eyes because she was looking at other men. The situation got worse and soon Andrew did something to their baby too. The cruel final came when Andrew killed his wife with a knife. After both had died they went to the Zeitgeist realm where they relived the day Andrew murdered his wife over and over again. (Deadline#3) - One night Judge entered the Zeitgeist with Kat Farrell and visited Andrew and his wife. They saw the murder twice and Kat wanted to help Andrew's wife, but the Judge stopped her and carried her away from the scene. (Deadline#3 (fb) - BTS) - In the 1920's Detective Patrick Callaghan fought with the Convetti family and tried to shut down their liquor trade. One day his wife Jodi was shot in the public by killers of the Convetti family. Patrick retired after her death. After his death he came to the Zeitgeist realm where Patrick and Jodi relieved the day of her death over and over again. (Deadline#3) - One night Judge was brought to the scene of Jodi's death. He talked to Patrick when suddenly the killers returned. Judge opposed them and absorbed the killers and their car into himself. Weakened by this he fell to street and when another car with killers came, Kat Farrell had to help him to get out of their way. After that Kat and Judge left the scene. (Deadline#3 (fb) - BTS) - The past of the carriage and its driver is a mystery. 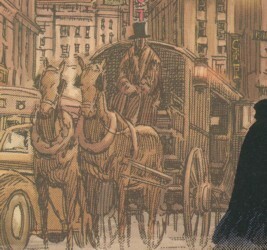 Since Michael Hart's death the carriage came each night to Gramercy Park after Judge was summoned there by the spirit's voice and from there it took him to the Zeitgeist realm where it drove Judge to many different murders he had to watch. (Deadline#3) - One night the carriage took Judge and Kat Farrell to the Zeitgeist realm. It first took them to the murder of Andrew's wife, then to the murder of Jodi Callaghan and at last to the murder of Alice Hart. (Deadline#3 (fb) - BTS) - Alice Dickinson was a professor in paranormal studies. She worked on many theories and one of those was about a place she called Zeitgeist, which was for spirits not ready to pass on. One day Michael Hart brought her in to testify that Black Cat was possessed by a necklace she had stolen. After the case was won Alice and Mike became a couple. She changed his life and he swore to become a better man. (Deadline#3 (fb) - BTS) - To their first Anniversary Alice bought the necklace from the Black Cat case for Michael and gave it to him after an exorcism was performed on it by a priest. (Deadline#2-3 (fb), Deadline#4 (fb) - BTS) - Alice and Michael came home to their apartment building and she went up alone to their apartment where she surprised the Tinkerer, who accidentally killed her while they struggled. (Deadline#1 (fb) - BTS) - Alice was found murdered in her apartment and her newlywed husband was missing. (Deadline#3) - In the Zeitgeist Alice's ghost was happy to see Michael again. She told him and Kat that the murderer was already in the apartment when she entered. He showed him to them, but it was only an unrecognizable shadowy figure. (Deadline#3 (fb) - BTS) - It was once stolen by the Black Cat because she was possessed by it. After this was proven by the testimony of the future Alice Hart the necklace came to plaintiffs. Alice bought it from them, let a priest perform an exorcism on it and then gave it to Michael Hart as a present to their first Anniversary and Michael always wore it. (Deadline#1-4) - Michael now known as the Judge wore the necklace all the time.